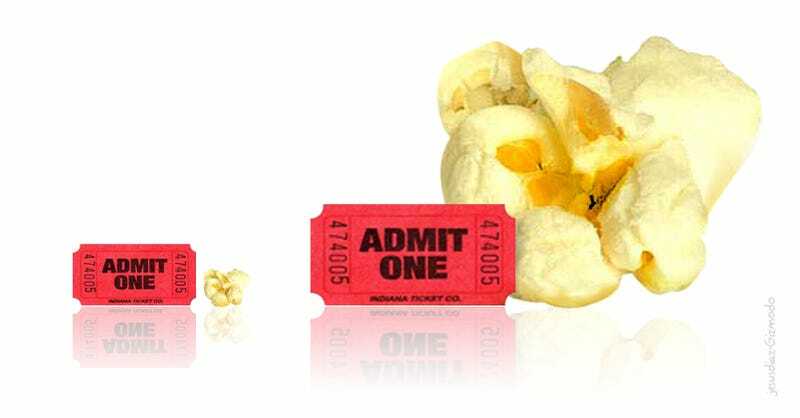 Here you see a movie ticket and kernel popcorn, as scaled to their price increase over the past 80 years. On your left, 1929. On your right, 2009. Needless to say, things have changed. In 1929, The Great Depression popularized popcorn as a movie time treat since it was cheap, easy, tasty and somewhat filling. Back then, a bag cost you 5 cents. Now, a (small) bag costs you $4.75. Sure, our new bag is probably a bit bigger, but it's vastly more expensive. What gives? As many of you know, Hollywood takes a majority of ticket proceeds (we're talking upwards of 70% or more) during the first few weeks a film is released. Not so coincidentally, those first few weeks are also usually a film's best-attended screenings. So theaters fall back to popcorn, soda and candy to make money because Hollywood doesn't see a cut of these sales. But is this 666% popcorn price increase evil? Obviously, numbers don't lie. Has the increased price of popcorn helped keep ticket prices in check? Possibly, though there's no real way of knowing. Still, one thing's for sure: Those stadium seats and surround sound systems won't pay for themselves...right? Movie ticket data is based upon stats by the MPAA/NATO, seen here, with a 2009 estimate based upon the 2008 price. Realize that movie ticket price is always an average of all tickets sold per year, which drops the price greatly due to child tickets, matinees and second run theaters. Popcorn price was based upon the widespead 5-cent bag of popcorn compared to a small popcorn from the AMC in Brooklyn, OH—which we feel is, if anything, a conservative sampling of movie popcorn prices. We'd love to have an average sale price on movie popcorn across America (just as we do tickets), but that data is not tracked by either the Popcorn Board or the National Association of Concessionaires.